EWG scientists reviewed Badger Damascus Rose Antioxidant Face Oil for safety according to the methodology outlined in our Skin Deep Cosmetics Database. We assess the ingredients listed on the labels of personal care products based on data in toxicity and regulatory databases, government and health agency assessments and the open scientific literature. 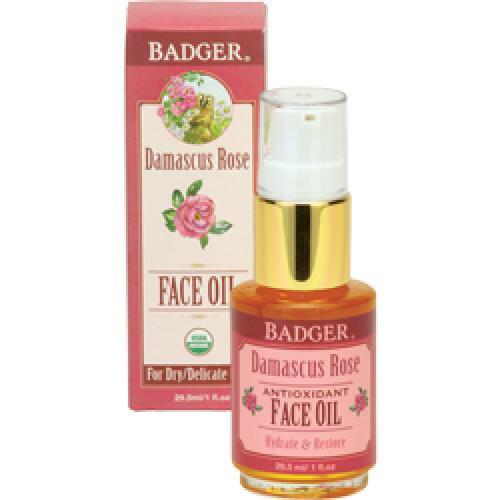 EWG's rating for Badger Damascus Rose Antioxidant Face Oil is 1. CALENDULA OFFICINALIS (CALENDULA) FLOWER EXTRACT. Apply daily as an intensive moisturizing facial treatment after shower of before bed. Ideal for dry, mature, or combination skin.